... 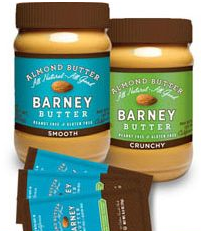 I am loving a new food discovery - Barney Butter. It is the best tasting almond butter I have ever had. I've tried to switch from peanut butter to almond butter in the past because I know that almond butter is more nutritious, but just have not been able to find an almond butter that I like. Barney Butter is better than the best peanut butter out there. (Say that 5 times fast!). Another thing I love is that they make little mini packs of Barney Butter for on the go. ... Another tasty new fave that goes pretty darn well with my other new fave are 34˚ Whole Grain Crispbread, a very clever and delightfully healthy cracker. It is a wafer thin, crispy and toasty cracker perfect for enjoying with soup, cheeses, peanut butter/almond butter, or to serve simply as a healthy snack. These crackers are a low-calorie cracker baked without oil and made using only three ingredients: whole wheat flour, natural cheese flavor, and salt. One 9-cracker serving contains only 35 calories, 0 grams of fat and 12 grams of whole grains. This Mama likes. ... There is a lot of love in the kiddo sphere for silly bands and slap bracelets. Seeing kids arms decked out with bracelets takes me right back to my childhood and the craze of friendship bracelets and madonna gel bracelets. When I saw these Slap Watches I knew they'd be a big hit with my kids (and me). It takes the slap bracelet up a huge notch! Remember the swatch watches with interchangeable bands and faces? Aah, the choices, and aah the pricepoint! ... One of my favorite things about this new year is my new calendar from Wiley Valentine. It sits on my desk in all of its letter-pressed beauty. I love the turquoise and green colors, and the design is the perfect combo of feminine and modern funky flair. The little owl who sits solemnly on top of 2011 reminds me to make the most of each day. For those of us who like to drool over stationary, the Wiley Valentine site is a gold mine.